How many years have you been playing UO? Most players answered they started before the Age of Shadows, at least 80%. This shows that the current player base is very old and been around a long time. It also shows that newer people have not been staying around. Typically, how many days of the week do you play UO? Lots of people said 7 days. Probably 80% are playing 4 days or more a week which when combined with the length of how long people have played UO shows a very dedicated player base. Where do you get your event news? The big surprise here was how many answered UO.com. It is apparently very important that the calendar on the official website is updated and accurate. It would also be nice if there was a way for players to get their events posted on their. The format could also use improvement with some kind of filter by shard. How many EM events have you attended this year? For such a dedicated player base, it was surprising to me that most people only attended half the events. Very few people answered they attended them all. When you combine this question and the next one it points to people not being very into the existing story line. Do you come to EM events only to get the item drops? A solid 70% or more said no, which was very surprising. You always hear “people only go to events for the drops”. Well just look at the number of people who said no. Perhaps a lot of the players who only come for drops did not come to this focus group (which does not make sense since a drop was given away here). In any case, a sizable number of players care about the story that goes on. Which UO city do you identify with or call home? The standouts were Britain, Skara Brae, and Trinsic. This was not real surprise that some cities are favored a lot more than others. Did you vote in the last city governor election? Do you know the name of your city governor? Voting was about 50/50 and naming your governor was more in the no category. As has been established in earlier questions, these numbers point to a lack of interest in the governor system in general. You could already tell by how poor attendance is at the monthly governor meeting. This needs to be worked on. Should something be done about Greater Dragons? The very few that answered no were probably joking. 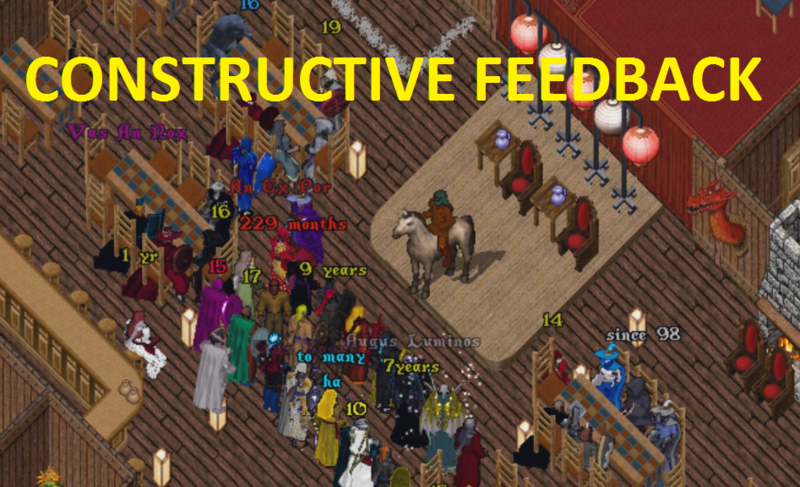 This is an ongoing issue that is reducing the overall event experience. Something should be done about it. Besides Overthrown Blackthorn, the other four titles I came up with real quick. This is definitely a question that could have been thought out better. The “Burning of Luna” poisoned the responses because everyone would love to see that. When asked which story people wanted the most out of all those about 50% said Luna, 20% said Gargoyle Invasion and 20% said Blackthorn Overthrow. If you took out the Luna question, Blackthorn Overthrow would probably be the most selected. Keep checking back for more event information and articles! Do you have news or content that should be posted here? Drop me an email: Also seeking reporters! Beldin Blightaxe has Gone Missing!